In this article you will find the perfect solution for hot days and for your gourmet cravings. Easy to make, particular to taste and fresh, this is part of a new growind trend of salty dessert. 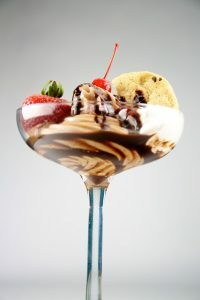 So, if you are curious and want to experiment something new, try our Balsamic vinegar of Modena ice cream. milk 1/2 l., sugar 30 g., egg yolks 3, balsamic vinegar of Modena 100 ml. and ice cream thickener. Mix the milk and thickener and boil. Beat the eggs with sugar and whip until you get a white paste. Pour slowly the milk on the eggs and sugar mixture. Don’t let the eggs harden. Pour the paste into a casserole and water bath it until you get a creamy texture. Meanwhile reduce the balsamic vinegar and mix it in the cream. Put the casserole in the freezer and wait until you have an ice cream. This particular dessert matches perfectly with strawberries. You can, of course, eat it alone during you netflix nights! So eat the gourmet summer with the balsamic vinegar of Modena ice.